Last weekend I wrapped up construction of a sandbox for the kids. I had to wait on the canvas to arrive so it took a week longer than expected, but I think it turned out great. It’s made primarily out of cedar, with pressure treated decking material for the bottom and the legs. 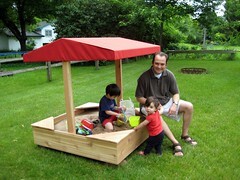 The top is a roof with gables, rafters and the whole bit, wrapped in Sunbrella weatherproof canvas. It took about a day and a half to build, and the garage smells nice with the cedar sawdust! You can see more pictures by clicking on the image on right. They all look about the same, though! Finally! I was able to wrap up building the base cabinets, installation, and some finish work on Sunday evening. I spent the rest of the week trying to put everything away in their new home. There is still a bit of work to be done as far as organization goes, but, overall, I’m in good shape to start building things. One with the doors shut and another with them open. At the bottom of each lower cabinet is a big pull out tray where I store some of my larger tools. It’s pretty convenient. The doors are handy because it keeps things pretty much dust free. The drawers are nice becuase they use full-extension drawer slides. I can pull them all the way out to make it easier to use all of the available space. I’ve placed all of my big tools (radial arm saw, table saw, jointer and drill press) to the left side of the shop. I haven’t tried pulling in a car to see if it will fit yet, but I’ll try eventually. I know I’ll be able to get at least one car in there when winter arrives. Since I’m taking the bus, DeAnne’s car will stay warm. This is a decent view of what the garage looks like now. It’s a big difference from a few weeks ago. Things are a lot more organized and I don’t have tools laying around in buckets and the wheelbarrow anymore. My old clamp-pegboard unit came in handy and I’m using it to store the rest of my tools. I’m still working on organizing things but it’s orderly enough to let me work. In a way, a workshop is never really finished; it’s a constant work in progress. Plywood can warp. I’m guessing this is why Norm suggests using MDO instead of birch-ply. Some of my doors are a little out of whack due to this problem. Maybe Lowes plywood is in danger of this more than something from a plywood dealer. Maybe not. Along with point #1, sometimes it’s better to not cut everything all at once. I cut every piece of the top and bottom units before I started construction. The 100 degree heat along with the high humidity really did a number on some of the cut pieces. Since I built the top units first, the pieces for the bottom unit sat around for two weeks before they were used. Measure twice, cut once, measure twice, cut once, measure twice, cut once. Can’t say it enough. Take your time and read the directions/plans carefully. I had to re-do all of the drawer backs because I misread the measurement. They were all a 1/2” too short. Ugh. Precision counts with drawer slides and hinges. I got impatient with the bottom door hinges and it cost me an extra 2 hours of tinkering to get them close to correct. Dumb. Take the time to think about grain direction and color matching. One of my drawer fronts has the grain running vertically as opposed to horizontally like the rest. Two of the bottom doors are way lighter than the rest of the doors in the units. A dust collection system would be really nice to have. I’d still rather have a bandsaw, though! One of my first projects in the new house is to create a new workshop for myself and my tools. The “workbench” that was originally in the garage was beyond useless and was held up with a couple of cinder blocks and located directly beneath a make-shift storage shelf. This left me about 2 inches of clearance between my head and said shelf. Not a good environment for working with wood. So, I went about trying to find plans for building my own workbench and storage system. After searching around the ‘net for a few days, I decided to go with Norm Abrams’ design for a garage workshop. His designs would give me a nice, big wall-mounted storage unit, as well as a workbench with cabinets, drawers, and a nice counter-top. I purchased the plans through his website and started planning. Next up was the installation of the wall-paneling. I picked up a few sheets of some thin, exterior grade siding from Lowes. It’s not really thick enough to hold anything heavy, but it looks pretty good, was inexpensive, and fairly easy to work with. It took a while due to all of the holes we needed to cut out for the outlets, but thanks to the finish-nailer, we got it up without too many problems. Once the panels were up and trimmed out, it was time to paint. I ran into some trouble here because I picked up a can of “oops” paint from Lowes for $5. I thought I was pretty clever after purchasing the paint until I started painting. I didn’t prime the surface first so when I went to apply the paint, it just soaked right into the paneling. The can said it would cover 350-400 sq. ft., but it only ended up covering about 100 sq. ft. before I ran out. Not to worry, however, because Jack, my father-in-law, went in the basement and mixed together every available can of paint we had. I have no idea if this is a suggested practice or not, but it actually came out really nice. Now that the wall was insulated, paneled and painted, it was time to start building something. Well, not quite. First I had to make all of the cuts from the 6 sheets of 3/4” birch plywood I purchased. That took about five nights to do. Once that was finished, I actually got to build the wall cabinets. We assembled them Friday night and hung them up on Saturday. I’m really happy with them and the hinges we picked up from Rockler work and look great. Lot’s of room, too. I finished up my son’s train table the other night. The paint job is pretty bad but I’m still working on it. The table was built with poplar and the top is 3/4” birch-ply. I used my Kreg pocket-hole-jig to make the joints. That thing is awesome, btw. The joints it makes are really strong, too. That’s important when you’ll have a monkey climbing all over it. Jack will be getting a new wooden train set to go with his table from Santa in December. I based the design of the table on a similar item at Pottery Barn Kids. Actually, it looks pretty much exactly like the one from Pottery Barn Kids. The difference is I painted mine and they stained theirs. Jay Dreyer's blog on whatever pops into his head...sports, tech stuff, Detroit, Minneapolis, etc.